Halloween is a wonderfully whimsical holiday; it’s the one night of the year when you can be anyone or anything you want to be. Your knitting can take on a new purpose at Halloween, too. If there’s anything weird and spooky you’ve ever wanted to create, Halloween is the time to get knitting. Creating a homemade Halloween costume is a truly rewarding experience, and that knitted costume can prove to be surprisingly handy. Think about it, if you’re out on a rather chilly Halloween night, wouldn’t you want to be wearing something warm? And we all know that hand knit garments, especially those made with wool, are about the warmest thing you can wear. When you think about the potentially cool weather of a night spent trick or treating, it makes perfect sense to want a knitted costume. Halloween can be a fun time of the year. Try out something new and make a homemade Halloween costume to make this year extra special. You certainly will not get cold when you wrap yourself in a hand knit garment, perfect for trick or treating. Besides getting tons of complements, you will have something to look forward to on Halloween—showing off your latest project. What would you be if you could be anyone? Grownups can get in on the Halloween fun too! These Halloween costume ideas are sure to spark some of that childish spirit that makes this holiday such an adventure. Try knitting up one of these knitting patterns in time for the big day. You will have just as much fun as your child when you dress up in one of these homemade Halloween costumes. Making your own Halloween costume can have serious benefits as well. If you want to stay warm while you are walking your little one door to door, a hand knit garment will certainly help keep you warm. Patterns like the Gothic Witch Cape (page 28) can be easily thrown over a jacket or light sweater for extra warmth. It’s an easy costume to make too; pair a witch’s hat with this cape and you will be ready to hit the Halloween Parties. You can reuse costumes like the Witch’s Cap for years to come. You will never get tired of being stylishly warm! If you do not want to go all out, you can try making something like the Spooky Hands Scarf (page 4). This creepy scarf will make any outfit Halloween-ready without requiring any extra props. The Spooky Hands Scarf is one project you can wear anytime of the year, any time you need an extra “hand,” in fact. Kids and adults alike are sure to love this handy scarf. There are all sorts of fun ideas out there for the adventurous adult who still feels connected to the Halloween spirit. One of our creepiest patterns in the entire eBook is just perfect for the man or woman who likes to give others just a little bit of a scare. The Jekyll and Hide Hat (page 15) is the perfect choice for the person who has a bit of a dual nature. This freaky hat can be worn like a normal beanie for day time events (or whenever you need to be incognito), but can be pulled down over your face to create a creepy facemask. The effect is truly startling, and has to be witnessed in person to experience the full effect. With so many wonderful options to choose from, you really have no choice but to make a fun homemade Halloween costume this year. Download your free copy of 7 Free Knitting Patterns for Homemade Halloween Costumes and Easy Decorating Ideas today! Get your kids into the spirit of Halloween with some fun knit costumes. Your spooky homemade Halloween costumes will be unique creations, ensuring that your child will stick out from the crowd. Knitting up a spooky costume or accessory for your child is a great way to show you care, and to make sure they do not get cold while trick or treating. There are several patterns for kids in 7 Free Knitting Patterns for Homemade Halloween Costumes and Easy Decorating Ideas, ensuring that you are picking from the best Halloween knits out there. Your kids will not be young forever, so take advantage of their youth to dress them however you want. 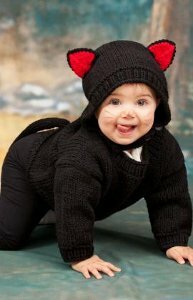 The Baby Black Cat Costume (page 21) is an adorable way to dress your toddler. Perfect for the intermediate knitter, this costume is essentially a toddler’s hoodie with a tail and ears attached. You could stick with black yarn for the classic black cat look, or you could change up the color for a more personalized look. Either way, your child will be the cutest cat out there this Halloween! If you are not sure that you want to create a whole sweater, take the time to look at the Knit Pumpkin Hat (page 19). This fun pattern is a fun embellishment that can also be worn throughout fall. The hat is knit up in orange yarn with a green stem at the top, so that your little one will look like a pumpkin. You can either pair this with a larger pumpkin costume, or create this hat as a fun way to keep your child warm on a chilly night. Though your child may one day grow out of these cute costumes, you will treasure the memories of your child dressed up in their homemade Halloween costume for years to come. Investing the time into a project just for your child will pay dividends. Knowing that your child is wrapped up nice and warm inside a hand knit item will be well worth the effort you put into creating the costume. Download yoru free copy of 7 Free Knitting Patterns for Homemade Halloween Costumes and Easy Decorating Ideas today! With your free copy of 8 Designs for Knitting: Free Patterns for Beginners and Easy Knitting Stashbusters eBook you can also subscribe to our Knit Picky Patterns newsletter to become part of a helpful and friendly knitting community. In subscribing to the newsletter you will receive: Six weekly emails with free knitting patterns, tips, collection pages, videos and more. Chances to win knitting books and products from our weekly giveaways and contests. New FREE knitting patterns made available to you throughout the year. Access to our free pattern library full of over 1,000 more free knitting patterns. The opportunity to share ideas and help others in the knitting community. With our latest eBook, 8 Designs for Knitting: Free Patterns for Beginners and Easy Knitting Stashbusters, you'll find yourself knitting any number of fun knitting stashbuster patterns. And once you subscribe to receive our newsletter, Knit Picky Patterns, you'll see how incredibly rewarding it is to be a part of the knitting community! Check out this free eBook and the AllFreeKnitting.com site to draw tons of knitting inspiration! your free copy of 8 Designs for Knitting: Free Patterns for Beginners and Easy Knitting Stashbusters eBook you can also subscribe to our Knit Picky Patterns newsletter to become part of a helpful and friendly knitting community. In subscribing to the newsletter you will receive: Six weekly emails with free knitting patterns, tips, collection pages, videos and more. Chances to win knitting books and products from our weekly giveaways and contests. New FREE knitting patterns made available to you throughout the year. Access to our free pattern library full of over 1,000 more free knitting patterns. The opportunity to share ideas and help others in the knitting community. With our latest eBook, 8 Designs for Knitting: Free Patterns for Beginners and Easy Knitting Stashbusters, you'll find yourself knitting any number of fun knitting stashbuster patterns. And once you subscribe to receive our newsletter, Knit Picky Patterns, you'll see how incredibly rewarding it is to be a part of the knitting community! Check out this free eBook and the AllFreeKnitting.com site to draw tons of knitting inspiration! With our latest eBook, 7 Free Knitting Patterns for Homemade Halloween Costumes and Easy Decorating Ideas, you'll find yourself knitting any number of fun knitting stashbuster patterns. And once you subscribe to receive our newsletter, Knit Picky Patterns, you'll see how incredibly rewarding it is to be a part of the knitting community! Check out this free eBook and the AllFreeKnitting.com site to draw tons of knitting inspiration! I can't wait to make my own Halloween costumes with these great patterns. Just received this book looks like some good ideas but cannot rate it as of yet.